I absolutely LOVE the dimensions of this tank. 72"x27"x27" In my mind a tank can't be too long, but in my wife's mind, 6' is as long as she would like. So... It's the perfect length. If I had it custom built I would have made it 30" wide, but it's not! The price was right, and it's very nice! The stand is being skinned professionally. I'll be painting it white on the inside and black on the outside. Everything will be sealed to look all shiney as well as be water proof. The canopy will rest on the top rim of the tank, but will be able to be suspended above the tank during maintenance. Should be finished by this week! Two overflows. Each 12"x6" in each corner. 3/8" glass interiors, black acrylic exteriors. Two 1.5" drains with dursos and two 1" returns. An extra 1.5" emergency drain as well. Acrylic 40x20x20 approx sump with dual sock filters and simple two chamber setup. NextReef SMR1 Solid Media Reactor for biopellets. Dual BRS Reactor for carbon and gfo as necessary. Reef Octopus Triple Recirculating External Skimmer. MRC CR-2 Calcium Reactor. P303 220mg/hr Ozone Generator. Reeflo Dart 3600gph return pump. 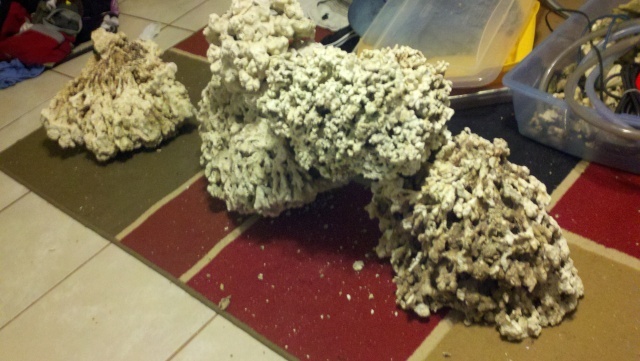 One Hundred Pounds of pukani/shelf from BRS mixed with another 50+ lbs of hand selected live rock by me. One MP40 w/ battery backup, One Tunze WaveBox and other koralia powerheads as needed. Reef Angel Plus Controller with several add-ons. PWM Expansion module to control LEDs, WiFi module for wireless control from my phone/mac, pH/ORP modules to allow me to monitor two pH probes (one for display, one for calcium reactor), and ORP (for my ozone reactor). Also has 8 controllable outlets. Being controlled will be my heater, a fan (hopefully the combo will keep my temp within 1 degree), my Calcium Reactor (two outlets, one for the solenoid, the other the feed pump), the feed pump to the biopellets/skimmer, ozone generator, my powerheads and a few more things... who knows what I'll add! LEDs of course. I'm going to try for a full spectrum LED setup. My three main heatsinks will have 28 LEDs each. After I set those up I'm going to look at the color temp and decide what other colors I will add. In the end I'll have 9 different color LEDs. Neutral White, Warm White, Blue, Royal Blue, UV, Cyan, Green, Red and Red/Orange. Whites will be about half and half. A few blues with mainly Royal Blues and just a handful of the rest to give that full spectrum coverage. Going for 20k when everything is at full blast. Will be able to fade between other colors with the Reef Angel Controller. Got my pukani! 100lbs of this rock is much more than other types of rock. I've got several large pieces. The largest is 22"x15" and still doesn't weight over 35 pounds. There's a piece several inches larger than a basketball and can't weight more than 20. OH MAN this stuff ROCKS!!! get it? Rocks! Lol. Okay couldn't help it. Here come the pics! 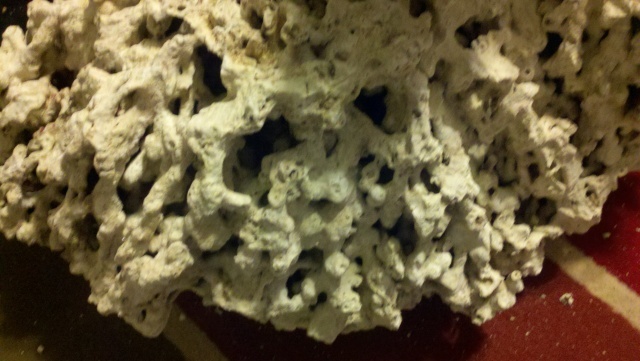 The first here just gives an idea of how porous it is. Incredible. Here's an example rock layout. 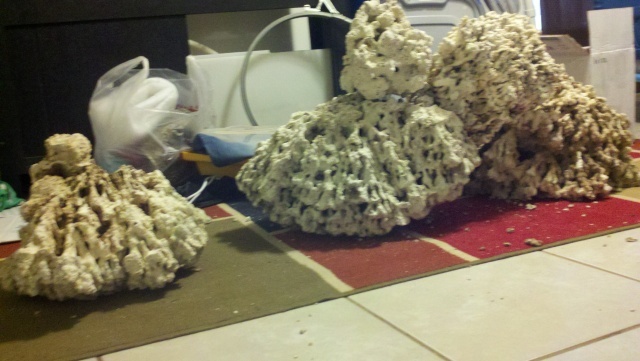 My BTA island is over to the left, and the larger sps dominant island is over to the right. This would leave about 2-3" clearance from the back wall and 5-6 inches clearance from the front glass. Highest point on the rock is about 17". That's the rock update. I love it. Would do it again 1,000 times. If you're considering pukani rock... go for it. You'll love it. Also I picked up a used Melev's Model G Modified Sump today (Check it out!) as well as two Sequence 4300gph pumps; one for a backup. I'm going to sell the Dart pump ($185ish?) and upgrade. Also decided that I needed to get an in sump skimmer rather than the mammoth external tdnw-300, so I grabbed an ASM G4XX. Pumped! Stand skin has also come in, need to paint it black now. All in all, a good day for the tank! Why did you decide the skimmer had to be in-sump? The new sump I got was 4ft long. I'm running an external pump as that will take up some of the left over 2ft. I also have the calcium reactor, biopellet reactor, dual brs reactor, ozone generator and reactor and all that stuff will take up lots of room. In the end, the extra space was more valuable than the bigger skimmer.